It is very complicated to include Tess great fanlisting management script Listing Admin into your WordPress run fanlisting collective, or even impossible without changes to Listing Admin itself. 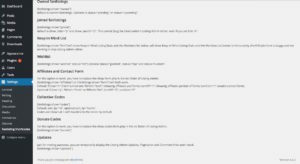 I decided to write a little plugin that lets you include your fanlisting collective with WordPress tags into your WordPress blog. 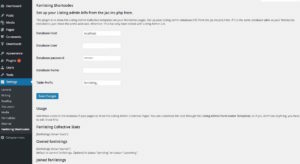 Instructions: upload the fanlistings.php file to your WordPress plugins folder and activate the plugin. 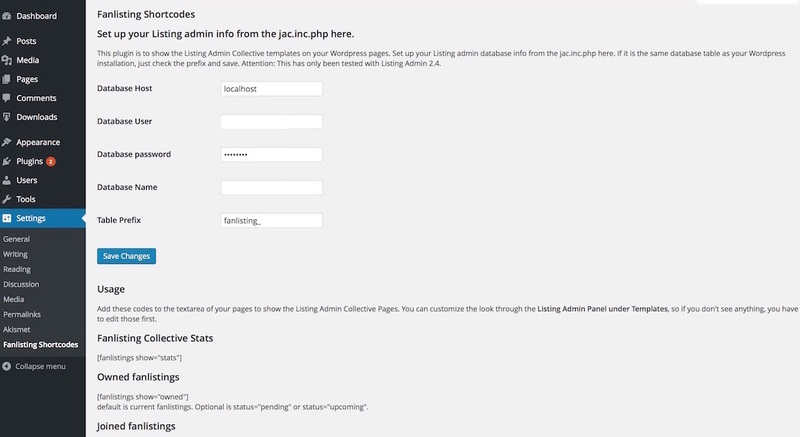 Then, add the database details from jac.inc.php to the Settings -> Fanlisting Shortcodes. Create your collective pages and add the following tags. Unfortunately, Wordpress reserves some variable names, so external forms with $_POST[‘name’] do not work. For making the contact form work, find it in your Listing Admin folder -> inc -> show-form.php , you have to replace it with $_POST[‘contactname’] and <input name=”name” also with <input name=”contactname”. The same for the show-codes-form.php. default is current fanlistings. Optional is status=”pending” or status=”upcoming”. default is show_lister=”y” and show_search=”y”. This cannot (bug) be deactivated in Listing Admin either, even if you set it to “n”. will show Keep in Mind Listing Stats and the Members list below. 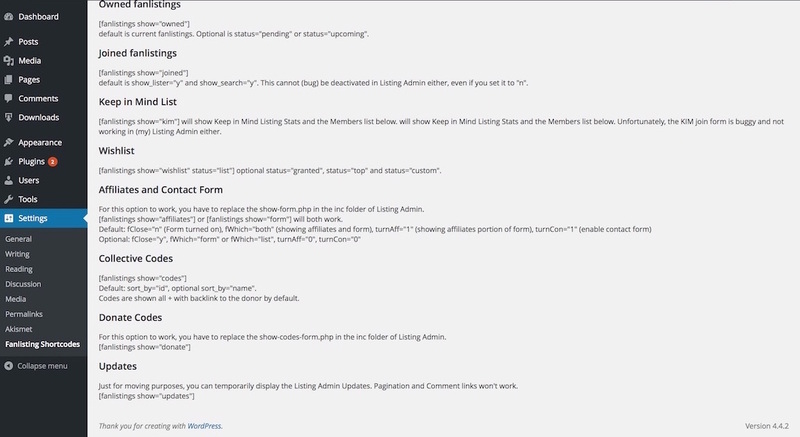 Unfortunately, the KIM join form is buggy and not working in (my) Listing Admin either. optional status=”granted”, status=”top” and status=”custom”. For this option to work, you have to replace the text in the show-form.php in the inc folder of Listing Admin as I wrote above. Codes are shown all with backlink to the donor by default. For this option to work, you have to replace the text show-codes-form.php in the inc folder of Listing Admin as I wrote above. Just for moving purposes, you can temporarily display the Listing Admin Updates. Pagination and Comment links won’t work.